Just tuning back in to gymnastics? I am continuing a series introducing the current USA Olympic contenders. McKayla Maroney is currently the best vaulter in the world. Though the USA has many gymnasts now doing the infamous amanar, NO ONE in the world does it like she does. Perfect form. Unmatched height. Catlike, dead center landings. It is magical watching her do that vault. McKayla also has a beautifully choreographed, graceful floor routine- with the potential for LOADS of difficulty. However, she has to get her landings under control. Her beam and bars are just ok. She looks like she has the body build to be great on both. But they are currently not events the USA would want to use her on in team finals. McKayla is a confident, dynamic and beautiful girl. She is fun to watch and shows so much potential. However, with Gabby, Aly and Jordyn all throwing great amanars, I think she is going to have to bring more to the table than vault to make the team. There are rumors that she is working hard to upgrade bars. I hope she can! McKayla would bring artistry, grace and those beautiful lines that international judges like to see. Lets hope she can bring those qualities on all her events to make the team! Here are McKayla’s best routines from 2011. Here is a fun montage of her from AshleyakaFlipper Montages. The Picture About Gabby Douglas Becomes Clearer. After a crash on vault, Gabby said her ankle was feeling sore. She went on to do an awesome bars set, but then fell twice on beam. Tonight she posted these pics on facebook. If you go back and look at her beam with her ankle in mind, I think she really did awesome! She made it through most of her routine landing time after time on that ankle. She was just a bit off on her front and landed full force on that ankle when her other foot slipped off. Then she fell when she once again had to land full force on the one hurt ankle. I definitely think this was the opposite of head case. I think she really held up well! Jordyn Wieber won the AA at last night’s Kelloggs Pacific Rims Championship, bringing a strong performance throughout the night. As the NBC broadcast closed, Tim Daggett said that it was the best four routines Jordyn has ever put together in one night of competition. I agree. She still has a little work to do – sticking her vault, really connecting her new passes on beam, and connecting her jumps at the end of her tumbling passes. But her performance was definitely worthy of a world champion. I was especially proud of her beam! When she unveiled her front handspring, backfull, back handspring combination two weeks ago I wondered if she would ever really be able to connect it. I mean, it is SO hard! And now, only two weeks later it looks GOOD! Still needs faster connection, but WOW. So impressive! As was her aerial side aerial combination. On the flight back to Michigan from New York the day after the American Cup, the coach of women’s world gymnastics champion Jorydn Wieber didn’t like the vibe he was getting. 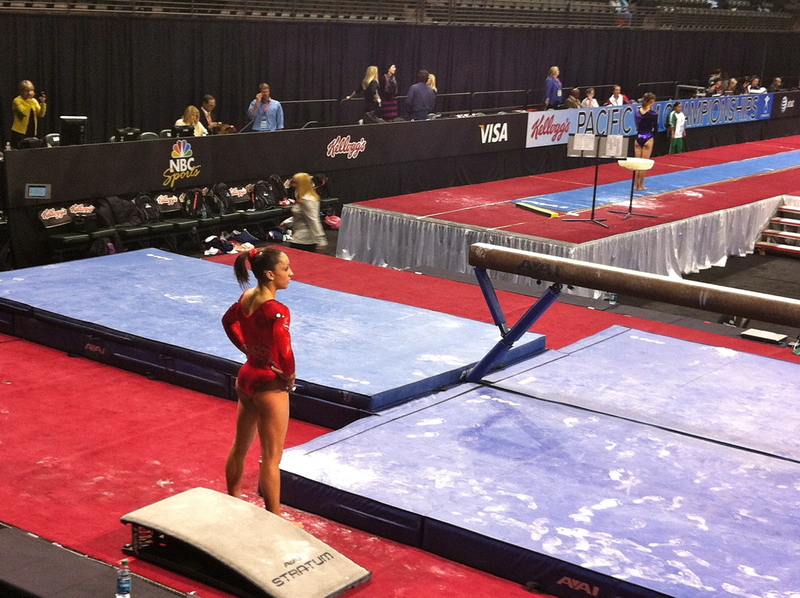 Asked on Monday how Wieber is doing, Geddert said that she’s coming off a “great week” of training. “Things are going according to plan,” he said. “Things are going according to plan.” I would say so! Great job Jordyn! It is rumored that she still has more upgrades to unveil, so hopefully we will see those at Classics. Did the Pacific Rims upset Gabby Douglas’s Olympic Dreams? One great performance does not a champion make. And one bad performance does not Olympic dreams break. Gabby Douglas went from bars specialist to all around threat with her great performance at the AT&T American Cup. There has been much anticipation over the last two weeks for this “show down” between Jordyn Wieber and Gabby this weekend at the Kellogg’s Pacific Rim Championship. That show down quickly became a one woman show when Gabby crashed on her first event. Jordyn put up one of her best performances yet. Martha suggested that Gabrielle Douglas’s poor performance was due to her trying a bit too much of her difficulty all at one time. She was “overpressured” Martha said, first by having done so well in New York two weeks ago and then being expected to do it all again here, and Douglas is a gymnast who needs to feel “absolutely secure” in her routines to do them very well. Martha suggests that dramatic changes (apparently Liang Chow wanted to introduce even more difficulty into her bar routine, giving her a 6.9 D-score, but that was seen as a little too much, so some of the difficulty was taken out at the last minute) suddenly don’t work with Douglas, and that Chow may still be getting to know his athlete and what works for her. I would say Gabby is still an “It girl” in Marta’s eyes, who just needs a little more time and experience. And the rest of the season will give her that! Besides, as our current top US bar worker- who put in a great bars routine even when everything else was going poorly- it will take a whole lot more to ruin Gabby’s Olympic chances than a missed vault or beam routine. Why I Love Our Comeback Queens. You dont see a lot of successful comebacks in women’s gymnastics. Once someone leaves the sport, it is incredibly difficult to make it back. Especially after they have left the teenage years behind. I have been struck with just how hard comebacks are in recent interviews with Nastia and Shawn. The ever positive girls all sound a bit frustrated, a bit tired. There is a reason not many women make comebacks to gymnastics in their 20s. It is HARD. Some people say that these girls have had their time, its time to let the next generation of gymnasts take over. After all, look at 2011 Worlds. A team full of rookies dominated. They looked like the most calm, collected, seasoned veterans out there. They hit routine after routine. We don’t need the veterans to win. And I agree. I think that we can win without them. But I think that we can win with them as well! And there is something else they bring that should not be underestimated. Maturity. The maturity that Alicia, Nastia, Shawn and Chelsie bring to gymnastics is so good for the sport. These young women are incredible role models and they are so inspiring. They inspire ME! And if I had a daughter in gymnastics, they are the people I would want her to look up to. I love watch interviews with our older girls. They bring depth and personality to their interviews learned from years of being in the spotlight. And there is just something beautiful about their gymnastics. It is seasoned. Mature. Their movement is more graceful, more “full.” Look at the difference between ALL of their artistry and dance from their teenage years to now. I would so much rather watch their current routines. And I hope that I get to see Jordyn, Aly and many of the others as mature gymnasts in the future as well! Creating a normalcy of older gymnasts in the US would do nothing but improve the sport in my opinion. I, for one, am really hoping that our olympic team is a blend of young and mature. Of superstar young girls and seasoned veterans. Only time will tell if any of them can make it back in time AND stay injury free in our incredibly demanding selection process. But I am rooting for them! 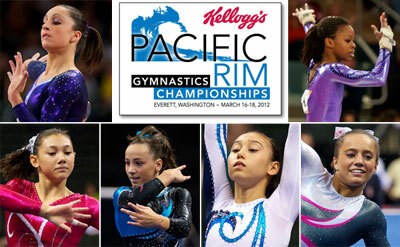 With the City of Jeslo meet coming just two weeks after the Pacific Rim Championships, I was wondering if the USA would send any of their top athletes to the Pacific Rims. I assumed they would not send Jordyn, Aly or Gabby to three meets in a row with only 1 weekend off in between each meet. On one hand, the Pacific Rims is in the US this year. How can you not send top US athletes to a packed arena of US fans? On the other hand, the tough competition will be in Jeslo. Do you want to match up Russia’s best with USA’s best before the Olympics? Do you want to let the Jeslo title go to Russia? And more importantly, what meets prepare the US gymnasts best? SENIORS: Jordyn Wieber, Gabrielle Douglas and Kyla Ross. As a ticket holder, I am super excited by the line up. I didn’t expect Shawn, Nastia, Chelsie or Alicia to be ready yet, so this is a line up I really want to see! The format for the team competition is 5 up 4 count with any mix of Juniors and Seniors. I am also really excited to see Katelyn! JUNIORS: Katelyn Ohashi, Lexie Priessman, Amelia Hundley, Madison Desch and Bailey Key. I am super excited to finally see Rebecca back in action! I am so hoping she will be back to her former self. But there are many names I am really surprised to NOT see on either list. 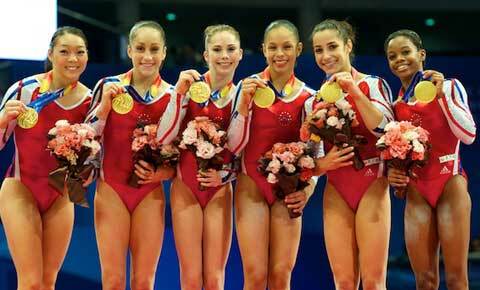 Sabrina Vega, Bridget Sloan, Bridgette Caquatto, Mackenzie Caquatto and Anna Li. The Pacific Rims will definitely be the meet with more media presence and pressure. Giving Gabby and Kyla more exposure to that and seeing how they hold up under it is definitely a wise move. And you have to give American fans their world champion. So I think the Pan Ams line up makes a lot of sense. As for Jeslo, who knows if Aliya will even be competing all around. Waiting til the actual Olympics for the showdown might be the best idea. And maybe Rebecca is ready to put on the pressure again! Though I am surprised by who they are not sending, in terms of the “bigger” names of who they are sending, I think that it is a good move. 3 big meets in a row! It’s definitely an Olympic year and I am a happy girl! Haven’t really watched gymnastics since the Olympics? Here’s what you need to catch up! Many gymnastics fans (I was one of them!) only watch gymnastics on an Olympic year. It makes sense. Gymnastics is hard to find on TV. But now, thanks to social media and the internet, gymnastics is easier than ever to follow. So, if you are just rejoining the elite gymnastics world, rejoice! It will be much easier to follow gymnastics! In the meantime, here are some things to help you catch up. First you have the D Score– D is for difficulty. The judges add up the value of the elements done in the routine. This includes basic requirements, the value of the skills in their routine and bonus points for connecting skills together. The D scores tend to be between 5.5 and 6.5 (ish) at the Olympic level. Of course you have some lower and some higher. Then there’s the E score– E is for execution. This is like the perfect 10 of old. You start at a 10 and are deducted for mistakes. These deductions are larger than they used to be, so this is why these scores are much lower than they used to be. A routine that looks near perfect to the average viewer will typically score around a 9.1. There is a pattern that these scores get higher in an Olympic year and some are speculating this will raise to about a 9.4. Needless to say, they are lower than your used to. What are our chances in London? The US won the 2011 World Championships by a huge margin. We have incredible depth in the all around as well as a large advantage on vault. There’s this magical vault called the Amanar that has an extra 1/2 twist than the vault most gymnasts are competing. It adds .7 to the start value (the D Score of vault). Most countries are struggling to have any gymnasts that can currently perform the vault. The US has atleast 5 contenders that perform it WELL plus another huge vault from Alicia Sacramone. That ends up being a 2.1 advantage over most other countries if they aren’t able to put up Amanars. However, the US has been weak on bars and both Russia an China can make up a lot of ground on this event. The US has great chances. But the competition will be fierce this year. Russia dominated in 2010. Their amazingly fierce and talented Aliya Mustifani was out last year and their other top gymnast was not at her peak. With both of them back, plus a strong new senior there is every expectation that it will be a battle for gold. China continues to be very strong. Not as strong as they looked in Beijing, but they still factor in to the mix. And you can never, ever count out Romania. They continue to improve, and if all their top players come in healthy, you can bet they will put the pressure on. Who are the USA’s top gymnasts? Right now, the list is very, very long! The USA is INCREDIBLY deep and it seems to be anyone’s guess who will actually make the Olympic team. This Olympic cycle, only 5 gymnasts can go to the olympics. The girls in bold are currently favored to make the team, but with only 5 members on this years team, you can see we have enough for 2 or 3 strong teams. The competition will be intense. You can follow the links to their bios or my Who’s Who in 2012 post on each athlete for more info. Lets start with some names you will remember from 2008. Nastia Liukin: Nastia has been living the glamourous life of an Olympic AA Champion. She has stayed incredibly connected to the sport but has only been doing light training. After being on the fence for years, she finally announced her plans to try to make the 2012 team at the 2011 World Championships. The US is weakest on bars and as Nastia is incredible on bars, if she can get them back to top form her chances of making the team look good. Nastia’s contribution would most likely be on bars and beam. Shawn Johnson: Shawn took a few years off without really planning on returning to gymnastics. After tearing everything in her knee on a skiing accident and she thought she might not ever do gymnastics again, she realized she really wanted to return to the sport. She has been working hard and showing incredible improvement but has continued to have difficulty with her knee. Shawn could be an all around contributor if she is able to get her difficulty back. She has also improved tremendously on bars in this comeback. Alicia Sacramone: Alicia made her comeback in 2010. She actually looked better in 2010 and 2011 than she looked in her former years of glory. She won the world vault title in 2010 and just kept getting better and better. She was in the best shape of her life and has been the definite leader of the US for the past two years. However, days before prelims at 2011 Worlds she tore her Achilles tendon. She is recovering well and recently returned to training. Alicia is a world class vaulter and had been working on upgrading her vault. She could be an Olympic champion on vault. She is also a rock on the beam and overall is an incredible team leader. Chelsie Memmell: Chelsie made her comeback in 2011. She was looking great, especially on beam and floor. Her bars and vault have been slower to comeback. However, she looked great until injuring her bicep at the 2011 Visa Championships. She is rehabilitating and training for this year. Chelsie has the worst luck in timing of injuries. If she can get and stay healthy, there is no other competitor like her. Bridget Sloan: Bridget never quit training the sport and was the 2009 World Champion. In 2010 she only competed bars at the world championships and she been behind the scenes now for the past couple of years with injuries. She competed for the first time in a long while at the 2011 Pan American games. It is a bit unknown where she stands. Rebecca Bross: Rebecca took the gymnastics world by storm in 2009 and 2010. She was incredible dominant in all her competitions but failed to take a world championship title with uncharacteristic falls in both years. Even so, she was definitely the top american gymnast both years. She competed 2010 Worlds with hairline fracture in her foot and afterward took time off to have surgery. She competed for the first time in 2011 at the Visa Championships where she had a knee injury that took her out the rest of the year. Rebecca is a force to be reckoned with. As well as being a top all arounder, Rebecca is also great on bars. However in all her time of injuries, she has not looked like the former rock of a gymnast she was. It will be interesting to see how she comes out this year. Mackenzie Caquatto: Mackenzie was on the 2010 team mostly for her great work on bars. She was expected to be on the 2011 team for the same reason, but was injured at the 2011 training camp before worlds. She is competing both NCAA and elite gymnastics at the same time, which is almost unheard of. She has a great contribution on bars, however may need to upgrade her difficulty to make the team as a bars specialist. Alexandra Raisman: Aly is our USA rock. She is so steady and comes through with performances that look just like she practices. She is phenomenal on floor and great on vault and beam. Bars is her nemesis and keeps her from fighting for the gold. Aly continues to improve her form and has some major upgrades on floor- doing some of the most difficult tumbling in the world. Aly’s dependability make her a favorite for the team this year, but her weakness on bars does make her a bit on the bubble. If some of the other strong all arounders come through, they might bump her off. This team of rookies took Worlds by storm. Even with the last minute loss of their team leader, they had one of the most dominate performances in a long time, hitting every single routine in prelims and in team finals. Jordyn Wieber: Jordyn is the current World Champion. She competes some of the most difficult skills in the world with dynamic precision and impeccable form. Her weakest event is bars, if you can call an event where you make world finals weak. Jordyn is mentally tough and focused. Her biggest challenge this year will be the pressure of being the one everyone is trying to beat. Gabrielle Douglas: Gabby is really great on bars. She SWINGS bars with incredible fluidity, beautiful lines and high flying tricks. Gabby was a bit unpredictable on the other events last year, but really came into her own at the recent American Cup. She upgraded every event, and came in with new confidence and poise. McKayla Maroney: McKayla is the current World Vault Champion. She does the infamous amanar with such ease, grace and an explosion of power, it is in a class of its own. She also has a beautiful, artistic floor routine with lots of difficulty. However, her landings have been fairly inconsistent. With so many other gymnasts that can do amanars well in the US, she is going to have to up her game in another event as well (in my opinion) if she wants to make the team. Sabrina Vega: Sabrina competes floor with such grace, fluidity and great choreography. She is a solid, consistent gymnast who really came through for USA last year. She is also a sweet darling personality! She will have to come out with much more difficulty and dynamism to make this years team. Anna Li: Anna Li is a former NCAA star. After her NCAA career, she has been training as a bar specialist. She has one of the highest start values in the US. She was injured before prelims at the World Championships so did not get to compete bars for the US. As team USA needs a bar specialist, Anna has a chance to be on this team. However with Nastia and Gabby as well as Rebecca Bross in the mix, it will be an uphill battle for her. Kyla Ross: Kyla comes into her senior year as the Jr. National Champion. She is a top all arounder and has a great Amanar. It will be interesting to see how her gymnastics lines up with our current senior all-arounders, but she is expected to do well and have a legitimate chance at making the team. This year looks to be one of the most exciting years in a long time in gymnastics history. Stay tuned! It’s Finally Elite US Women’s Gymnastics Season! What a beautiful, wonderful thing to continually open up my facebook and see gymnastics posts. Articles, videos, and interviews galore! It is a gymnastics paradise right now. And this is just the beginning! 6 more months of this… I am a happy woman. This last weekend kicked things off with the American cup. In case you missed it, watch the NBC replay. March 31, 2012 – No rumors of live streaming yet, but you tube videos always surface. All-session ticket packages on sale now. Multi-Session ticket packages on sale Friday, Feb. 24 at 10 a.m. Interested in volunteering? Click here to sign up. Broadcast on NBC live, Sat., June 9 – 1-3:30 (Men); June 10- 4-6 (Women).